The Work-Life Equation: Six Key Values That Drive Happiness and Success is for the millions of people and business managers who are surrounded by bad behavior--with its attendant mediocre or unsatisfying results--at work and in their private lives, but who hope and dream for happier and more successful lives. 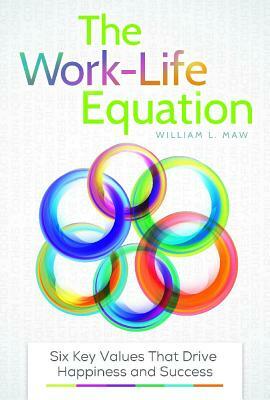 The book begins with a frank explanation of the need for self-awareness and self-improvement, then describes how the "winning formula" and the equation for happiness and success in work-life--(H, S) = f(4C,2R)--can be applied via six types of behaviors to effect sweeping changes. The formula means Happiness and Success can be achieved by (is a function of) Cooperation, Consideration, Compassion, Courtesy, Respect, and Responsibility. The book focuses not just on the meaning of these values but also on how to "better live" them. It concludes with a self-assessment tool for the individual, team, or organization to complete that enables objective measurements of behaviors and identification of areas of potential improvement. Dismissing the familiar, corporate value clich's, the author focuses on six key values most readers probably learned as kids but have forgotten about in adulthood--or didn't realize were still apt and relevant. The book provides priceless information and guidance for all readers but will be especially appreciated by those in the corporate workplace interested in self-improvement and success, educators and business students, executives looking to shift their firm's behavioral atmosphere in a positive direction, and individuals seeking inspiration and hope in their daily lives. William L. Maw is a business executive, social entrepreneur, and mentor with more than 30 years of workplace experience with large-, mid-, and small-sized companies.